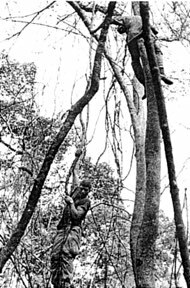 CU CHI - Two ralliers were glad to be alive after an encounter with 25th Divisions Charlie Company, 3rd Battalion 22nd Infantry, working east of the French owned rubber plantation recently. The Regulars were preparing to begin the days activities when the point element suddenly noticed seven Viet Cong crossing the open field to their front. "At first, I thought they were ARVN, because they didnt get down when they first saw us," recalled Private First Class Charles Boyle of Detroit. Immediately realizing that the seven individuals werent friendlies, the Regulars opened up with a heavy volume of suppressive fire and wounded one individual in the initial contact. Gunships, and later artillery, pounded the area where the VC were hiding. Charlie Company then formed on line to sweep the open area. As they did, one enemy surrendered immediately. Speaking through a Kit Carson Scout, the newly acquired rallier informed Captain James K. Skiles, company commander, that "four others (VC), were still in there, all armed with AK-47s"
"Using the buddy system, we had the ralliers try to coax his buddies out of hiding and join him:, said Specialist 4 Jerry (Tex) Franklin, of Ravia, Okla. "However, the attempt was unsuccessful and then we had to go in and get them using persuasive methods." "We stayed in hot pursuit of the fresh tracks left by the Ho Chi Minh sandals," said Specialist 4 Tommy Tompkins, from Carthage, Tex. Seeing that the enemy wasnt about to give up easily, Charlie Company still tried to take the remaining VC alive. While the company itself circled the enemy, the Kit Carsons moved out into the open, again trying to persuade the enemy to Chieu-Hoi. The VC again refused to cooperate and began to fire on the Kit Carson Scouts. The company reacted immediately, engaging the enemy with small arms fire and killing one while the others fled. On a second sweep of the area, the Regulars discovered another enemy hiding in the thick foliage about 25 yards away from their location. The enemy soldier had stayed behind to rally when his friends fled. The Kit Carsons interpreted as the Hoi-Chanh gave valuable intelligence. 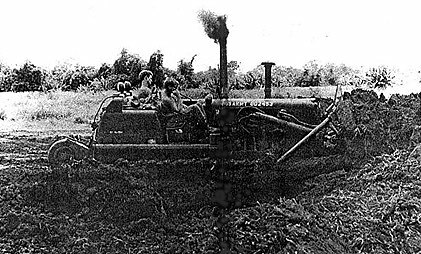 "The efforts of our Kit Carsons during the whole operation, was the major reason for its success," noted Private First Class Don C. Haddock, of Fairfax, Va. 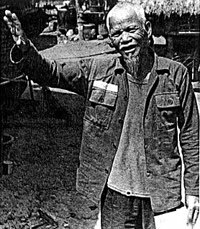 Refugees are the unfortunate by-product of any war, but recently 15,0000 homeless Vietnamese were offered a new start by men of the 25th Division and their allies. According to L.M. Smith, civilian refugee advisor for Phuoc Tuy Province, most of the refugees are Vietnamese nationals who had been living in Cambodia before increased VC and NVA aggression forced them from their homes. 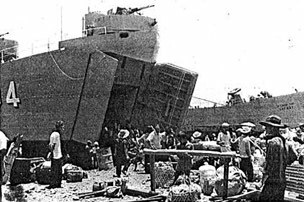 As the ships carrying the refugees docked at Vung Tau harbor, trucks awaited them to aid in the next step of their journey home. Working side by side, ARVN, Australians, and GIs of the 1st Battalion, 27th Infantry, loaded the families and their belongings aboard the trucks and transported them to a nearby airport. "These people are really excited about coming back to Vietnam, " said Smith. His words were echoed by an elderly Vietnamese man who told an interpreter that returning to Vietnam was like being born again. Sergeant John Musial, a Wolfhound from Trenton, New Jersey was impressed with the people. "Most of these people are craftsmen and fishermen," said Musial. "They should add to the prosperity of any village they are relocated in." Once aboard the airplanes, the refugees were taken to Phuoc Tuy, Binh Tuy, and Lam Dong Provinces where they will receive identification papers and be relocated in villages. "I always like this type of operation," said Wolfhound Private First Class James Kaltreider of Pittsburg, Pa. "Its a good way to make friends and create a better future. "After all, thats what were here for." XUAN LOC - In military jargon, "contact" means to engage the enemy with weapons. But for Specialist 4 Larry Foggin, of Gainsville, Fla., a rifleman with the 25th Divisions 1st Battalion (Mech), 5th Infantry, the meaning of "contact" recently took an unmilitary and much more personal definition. While on a night operation southeast of Xuan Loc, an element of Bravo Company began to receive rocket grenade fire. As the APCs (armored personnel carriers maneuvered out of range, and M-60 machine gun fell off one of the vehicles. Foggin, seeing the weapon fall, leaped off the track to get it. "I had moved back to about six feet from the 60 when I bumped into something," said Foggin. Much to his surprise, the something turned out to be someone, and Foggin found himself staring into the dark eyes of a real live Viet Cong. Apparently the enemy soldier was as surprised as Foggin, because both did an immediate about face. Foggin quickly returned to his track and blurted out a garbled account of the incident and directed fire toward the position of his contact. Later, Foggin, holding the M-60 he finally rescued, expressed no desire to repeat the incident. "Ive been in some heavy contact before, but this man-to-man stuff in the dark just dont get it!" What has eight legs, four wings, bites people, lives on garbage, sleeps in the ground and reads the TLN? Whatever it is, it can probably be found near Cu Chi someplace. 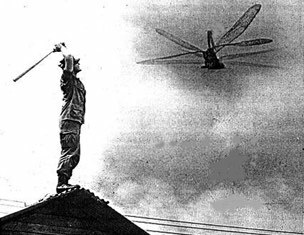 Among the major problems that servicemen encounter while in Vietnam are insects and rodents. Most of these pests are dangerous in one way or another. Some bite and others transfer diseases. Some do both. But for every pest, there is a way to eliminate both its presence and its danger. The most dangerous of all insects here in Vietnam is the mosquito. This insect is well known for its bite and as a carrier of malaria and yellow fever. It breeds in areas where there is stagnant or standing water. Drainage ditches and large standing pools of water are places where the mosquito is most apt to breed. Destroying these breeding places solves a large part of the problem. Drainage ditches should be kept clear and any already stagnant pools of water should be covered with a thin layer of oil, which will eliminate the mosquitos off-spring. For personal protection, malaria pills, although they dont get rid of pests themselves, do protect the individual from contracting malaria. Also the use of mosquito netting and insect repellant is highly recommended. Cockroaches are another familiar sight especially at base camps. They are associated with the filth insects, such as flies. Although there is no proof they carry any diseases, their habits and the fact that they live in filth make it a good probability that they do. Because they live in filth, it is important to see that all measures of sanitation are pursued. Garbage and edible wastes should be kept in closed containers, which in turn should be kept clean. Human wastes should be well disposed of. General policing of the area is necessary. Along with improved sanitation measures, cockroaches can be controlled by the use of insecticides. These are available through unit pest control sections, in a spray form or a dust (which is used in areas where there is a risk of fire). "However, it should be remembered that insecticides should be used only as an addition to sanitary measures and not as a replacement for them," says a spokesman for the 20th Preventive Medicine Unit. Flies are known to carry intestinal and other filth-connected diseases. They can be controlled in the same manner as that of the cockroach. Rodents and fleas are handled together because of their close association. They both are known carriers of such diseases as the plague and typhus. Rodents are found in unsanitary places, such as garbage and trash pick up points and latrines. However, because of the habits of rodents, they are fairly easy to control. Once they establish their runways and burrows, they will use these places until they are forced to move or until they die. Spreading dust in these areas will kill off the rodents. As they die, fleas will leave the rodents and after they make contact with the dust, they too will die. Another important reason for observing sanitation procedures is that Cobras live on rodents. So it follows, where there are rodents, there may be Cobras also. The children of Ap Don, a small hamlet near Cu Chi base camp, are soon to have a school of their own. "Donations, amounting to more than $750, from the men of the 25ths Supply and Transportation Battalion have been used for the purchase of brick and other building materials not available through regular supply channels," said Sergeant First Class William H. Hackley of Martinez, Ga.
Hackley, the battalions intelligence NCO has, as NCOIC of the school project, worked with Captain Michael S. Lackey, the civic actions officer from Pine Bush, N.Y., for almost a month, collecting donations and coordinating the purchase of materials for the school. "The brick and mortar and miscellaneous hardware items purchased with the donated money will be used by Vietnamese masons and carpenters who will do all of the construction work on the school", explains Hackley. The men scrounged ammunition boxes from aviation and artillery units in Dau Tieng and Cu Chi, dismantling and making them into benches, tables and other classroom furnishings. A ceremony was conducted recently in Ap Don. The commanding officer of the 25th S&T, Lieutenant Colonel Joseph L. Van Camp, of South Charleston, W.Va., layed the first brick of the schools foundation, initiating the buildings construction. The school, a two room brick structure with a tin roof, is expected to be completed and ready for classes to begin by mid-September. CU CHI  Men of the 2nd Battalion (Mech), 22nd Infantrys PSYOPS team are among the most well travelled soldiers in the 3rd Brigades area of operations. The team currently is conducting ICAPs (integrated civic action projects) in 13 separate hamlets northeast of Cu Chi. "With so many hamlets to cover, it requires a combined effort on the part of U.S. ARVN, and Kit Carson personnel," said 1st Lieutenant Michael Oliver, the units civic affairs officer. "To make the ICAPs really effective, we sometimes conduct three or four operations a day. "At typical ICAP begins with one of our Kit Carsons speaking over a loudspeaker to the people of the hamlet, making them aware of the purposes of the operation. He tells them that they have nothing to fear from the Americans who administer medical aid to the sick and pass out leaflets to everyone. "We work as a team to help the villagers in every way possible," Oliver of Iselin, N.J. continued. "Besides the medical treatment, we give candy to the kids and cigarettes to the adults." The ARVN and Kit Carson Scouts play an important role in the overall operations. "Having the Vietnamese troops participate increases our chances of obtaining valuable information from the villagers concerning recent enemy activity in the area," said 1st Lieutenant Peter Boni, a 6th PSYOPS Battalion team leader from Boston. Although ICAPs are not new to some of the hamlets, it has been some time since the villagers have seen a PSYOPS team. "In several of the hamlets, the people greeted us with fruit from their fields," said Private First Class Don Deeren, a Tripple Deuce medic from Sherwood, Mich.
DINNER IS ALIVE AND WELL AT FSB WARRIOR . . . The main course of a good Thanksgiving dinner has been flying around this base area for three years now. His name is typically "Tom" and Sergeant First Class Edwin Borrero prefers to think of him as a pet rather than a meal. 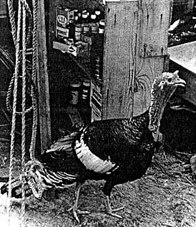 Three Thanksgivings ago, Borrero purchased Tom so that the men of the 2nd of the 12th could celebrate the holiday in traditional American fashion. But the bird never made it to the table. Tom, like the Warriors, appreciates a good letter now and then. He eats them. "Thats his only bad habit," said Borrero rising to the defense of his bird. Things get a little tense for Tom each year as Thanksgiving draws near. Good luck, Tom. Many happy returns of the day. A JOB IS A JOB . . . While purchasing a cold drink at Cu Chis snack bar, we noted with some amusement, the name and position tags of a couple of the Vietnamese girls who work there. One was "Popcorn Supervisor" and the other was "Popcorn Operator." NOW YOU SEE IT, NOW YOU DONT . . . Beware the soda and trinket laden children who lurk around mech and legmen. They have been known to possess extremely light fingers. Not too long ago a certain lieutenant with the 1st of the 5th had his camera stolen from a jeep along Highway 1 near Xuan Loc. Searching through all the childrens soda sacks, he came up with nothing. But soda. Then he had a brainstorm. He walked to the side of the road and began low crawling through the bushes. There was his camera, carefully hidden. Another man lost his radio and tried the same trick with less success. All he found was a case of root beer. Keep a wary eye. FSB TOMAHAWK  Daily routine tasks such as pulling guard and improving base defenses are all geared to being on guard against Charlie. Every day, troops of the 4th Battalion (Mech), 23rd Infantry perform such routine duties as putting up RPG (rocket propelled grenade) screens, installing claymore mines and trip flares, setting up radar, improving the berm line and pulling guard. Its all become so routine that most of the Tomahawk infantrymen take their job for granted. Its just something that has to be done. Every day. Despite the mud, rain or blazing sun. BERM PROTECTION  (Above right) A bulldozer scrapes up a protective berm at Fire Support Base Tomahawk for infantrymen of the 4th Battalion (Mech), 23rd Infantry. ROCKET RESISTER  (Left) Troops of the 4th of the 23rd stretch RPG (rocket propelled grenade) screen in place along a newly formed berm at Fire Support Base Tomahawk. CHARLIE WATCHING  (Right) By day this tower serves as a guard observation post. By night, radar (enclosed in plastic) takes over the job of Charlie Watching. Tower is at FSB Tomahawk, 20 miles south of Xuan Loc. 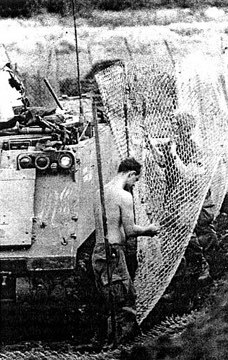 BARBED BARRIER  (Below) Infantrymen of the 25th Divisions 4th Battalion (Mech), 23rd Infantry carefully unroll concertina wire to help night defense protection of Fire Support Base Tomahawk located 20 miles south of Xuan Loc. 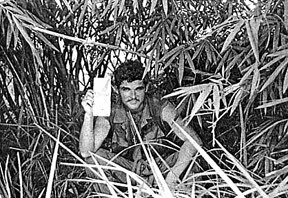 CU CHI  Pacification has become a focal point of the American involvement in Vietnam. Lending valuable aid to Vietnamese civilians, thereby furthering the pacification process, is one of the missions of the 12th Evacuation Hospitals out-patient clinic (OPC) at the 25th Divisions Cu Chi base camp. Under the direction of Sergeant First Class Ollie Nichols, the OPC provides a variety of medical treatments designed to heal the ailing Vietnamese. At the same time, a positive impression of the U.S. government is imparted on these special patients. "Almost 90 percent of the people we treat here were wounded by Viet Cong booby traps," Nichols said. "Weve been treating one papa-san continually for over a year now," Nichols from Amarillo, Tex., went on. "His left side was injured by a mine and he lost the left lung." After repeated surgery and numerous visits to the clinic, the patient is well on the road to recovery and a normal life. "The possibility of this man becoming a Communist sympathizer is now very remote," Nichols concluded. The OPC is staffed by two permanent medical doctors and four medical corpsmen. Periodic assistance is also received from members of the orthopedic, surgical and neurological services. Small children constitute a large percentage of the clinics patients. Typical is the case of a 12 year-old Vietnamese girl who has been receiving treatment for a foot injury resulting from a VC mine. "Her wounds are healing up nicely," said Specialist 5 Arthur Wilks, a medical corpsman. "Our biggest problem is getting the people to take proper care of their injuries," Wilks said. "They just cant walk through a rice paddie with an open sore. Many times they fail to clean the wound between visits to the clinic." As constant cleanliness is a must to prevent infections, the OPC provides various soaps and ointments to aid the people in the cleansing chores. FSB LYNCH  "Theres more to the mobile MARS operation than just driving out into the field and plugging in," said Specialist 4 Ron Knight as he swung the heavy field hammer on the steer grounding pin. Knight and Specialist 4 Peter Kahlenberg completed the installation of both rig and antenna within five hours and settled down to handle the scores of calls at Fire Support Base Lynch. Under the operational control of the 25th Divisions 125th Signal Battalion, the mobile MARS (military affiliate radio station) began passing calls on August 7 at Lynch. As in past operations at field sites from Bearcat to Katum, the MARS field rig is making it possible for men at distant field positions to speak with their families in the United States. Transported on a two and one-half ton truck, the MARS van is capable of setting up at practically any location in the 25ths area of operations. "Its really wild," one enthusiastic soldier exclaimed. "here I am ten thousand miles from home, surrounded by M-16s, sandbags and the monsoon and I just talked with my best girl in Baltimore. It was if she were next door." Utilizing stateside radio stations, MARS operators Knight and Kahlenberg can place a field soldier in direct contact with any location in the continental United States and Hawaii. Back at division headquarters in Cu Chi, the 125th also maintains a MARS station which is open around the clock. Of the thousand or more calls passed to the United States in any given month, priority is given to Red Cross emergency messages and to men from units on standdown. CU CHI  Under the watchful eyes of virtually no one, the 4th Battalion, 9th Infantrys S-1 shop held their first annual championship basketball game here recently. The teams were evenly balanced and stayed neck and neck throughout the first half, but then the tide turned as "Finchs Fast Cats" began to dominate the play and quickly walked away from the frustrated "Clerical Clowns". The "Cats", led by the considerable but agile Battalion X.O., Major James T. Finch, were quick to discover weaknesses the second time around and drove in time and time again  only to miss the shot. The day was saved, however, by "Cats" star, 1st Lieutenant William "The Golden Gun" Howell, the battalion adjutant, whose relentless shooting finally found the mark. Howell, of Lima, Ohio, whose style is strongly reminiscent of the late Velma Glandburger, a one-time roller derby great for the Lima Lemurs, sums up his success this way, "Im not short". DEAR SGT CERTAIN: When I was in a hospital in Long Binh, I got to know a local citizen. We became good friends and this Vietnamese friend expressed real interest in learning about American culture. I feel it would be good for international relations if this civilian was allowed to live on Cu Chi base for awhile. I would be glad to expend any extra effort involved myself. Do you think you could help me swing this great people-to-people project? DEAR P: It depends. Does she have a sister? DEAR SARGE: When I got to Vietnam, I grew a moustache. My wife says if I dont shave it off, she will grow one too. She can. Whatll I do? DEAR SFC: Make sure both are well-trimmed and dont exceed the corners of the mouth. DEAR SGT CERTAIN: My platoon sergeant found my hidden collection of pinup pictures and took me to see the CO. The CO brought me to his office and showed me his collection as well as a few he had on loan from the battalion commander. When I told my platoon sergeant what happened he said we were all "dirty" and then went to his hootch and cried. How can I console the poor guy? DEAR SOFT: Tell the poor sarge you didnt really mean it. The pictures were just there to keep the dust off your comic books. Find him a copy of "Batman meets Archie and Veronica." Hell know your hearts in the right place. ONE VOTE FOR THE BLOND  As we were electing our TLN girl of the week, a very important day came to mind. DEROS? No, election day back in the world. If you havent obtained your absentee ballot as yet, contact the voting officer in your unit. Time is running out. 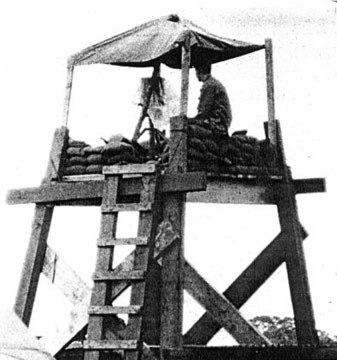 CU CHI  When an artillery radar section moves to a fire support base, foremost in the minds of the radarmen is the crucial question "exactly where are we?" There is no cause for anxiety, though. 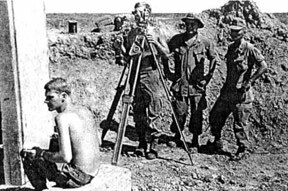 Before the radar or guns ever roll into the base, an artillery survey team goes to the new location to calculate the exact grid coordinates of the point where the radar or howitzers are to be emplaced. The survey team of the 2nd Battalion, 77th Artillery recently set up their equipment at Fire Support Base Snyder, northeast of here, to compute data for the battalions radar section. Starting from a previously established control point, the crew oriented its location by computing the direction and distance to a second known landmark. "We like to use Nui Ba Den (Black Virgin Mountain) or the sun as our second known landmark whenever possible," said Sergeant First Class Neil Orness of Lake City, Iowa, chief of the Up Tight survey section. "We always know the grid coordinates of the survey control point and the second landmark, and then we calculate the direction and distance between the two. This gives us the data we need to establish our other survey stations which will eventually take us to the point where the radar is to be placed." Nui Ba Den and the sun were both hidden by clouds on this particular day, so the team had to use a nearby 120 foot tower for its second landmark. The crew uses a complex instrument called a theodolite to measure the angles between the successive survey stations. Then two surveyors, known as computers, take this data and apply geometric and trigonometric principles to determine the exact direction for each station. Each computer acts as a check on the other to insure accuracy. Simultaneously, two other crew members, known as tapemen, stretch a 30-yard steel tape between stations to measure distance. All of the calculations give the team the grid coordinates of each new survey station. The last leg of the survey is from the final survey station to the point where the radar will be set up. As an insurance check for accuracy, the team measures the angle from the radar location to either the initial control point, or the second known landmark. "Our particular survey section works under an allowable error of one tenth of one mil for direction (there are 17.8 mils in one degree) and one one-thousandth of whatever unit we happen to be using for distance," Orness said. When the radar section moves to its new location here, it will know its grid coordinates and the exact direction to the 120 foot tower, thus enabling the radarmen to provide the howitzers with accurate data on enemy activity and locations. 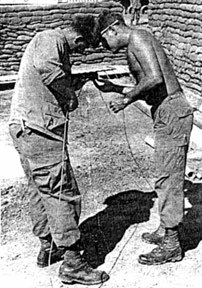 Left top: PULLING TAPE  Specialist 5 Jerry Pyles of Springfield, Ohio (foreground), a member of the 2nd Battalion, 77th Artillery survey section measures the distance between two survey stations as other members of the team gather more data. 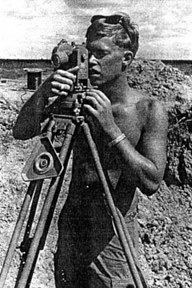 Right top: HAIRLINE  Sergeant Bob Forbes, of Iowa City, Iowa, a member of the 2/77 Arty survey section uses a theodolite to measure the angle between two survey stations. Left bottom: PRECISION  Specialist 5 Jerry Pyles, of Springfield, Ohio (left), and Specialist Ed Szymanski, of East Hartford, Conn., members of the 2nd Battalion, 77th Artillery survey section take a reading from a 30 meter steel tape. Right bottom: PROPER FIGURES  Specialist 4 Bill Horton, of Greensville, Miss. (lower left), waits for other members of the team to measure the angle between two survey stations, so that he can record the data. DAU TIENG  A small 25th Division recon patrol found out recently that the training soldiers receive in AIT definitely pays off. 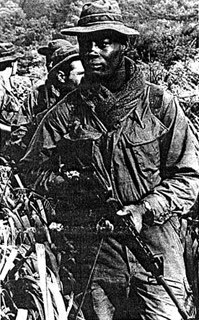 Sergeant Robert Silva, of Petaluma, Calif., was in charge of a reconnaissance patrol from Company A, 2nd Battalion, 14th Infantry Golden Dragons, looking for a night AP (ambush patrol) site. Shortly after starting out, they came upon a clearing and spotted a VC walking through it. "Our pointman opened up on him first, then we all got on line and started firing too," Silva said. "About that time, we started to receive fire from four or five positions around the clearing and I realized that we had walked into an ambush." The patrol quickly hit the ground and returned fire until their ammo started running low, and it became obvious that they would have to pull back and call in support. "Our retreat was beautiful, just like we used to practice on assault in AIT, only backwards," said Private First Class Wendel Ratliff, of Portsmouth, Ohio. "One man would fire a few rounds, then get up and run back a ways while the others laid a base of fire. Just like the old "Bravo team, prepare to move out! Move out! stuff in training. It really worked and no one got hurt." 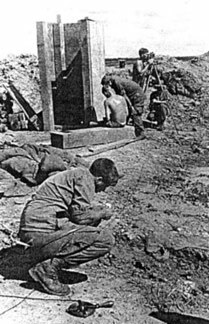 After several minutes of maneuvering, the men made it up a trail, where they sprayed the area with M-16 fire and called in artillery from an old VC bunker. Pointman, Specialist 4 James Baker, of Brewton, Ala., summed up the afternoon by saying, "I always knew that staying awake in training classes would pay off someday. Id hate to think what would have happened if everyone had tried to get away at once." CU CHI  By order of the secretary of the Army, the 25th Divisions 725th Maintenance Battalion has been awarded the Meritorious Unit Commendation for exceptionally meritorious achievement in the performing of outstanding service. The award was for the period from February 15, 1969 to August 15, 1969. Acting in behalf of the secretary of the Army, Division Commander Major General Edward Bautz Jr., presented the commendation to the men of the 725th. Almost half of the soldiers present at the ceremony were members of the unit during the time cited in the award. Bautz expressed his personal appreciation to the 725th for doing a "fine job and bending over backwards to help other units." According to the citation, the "Service to the Line" battalion exemplified diligence, initiative and professional expertise by providing direct support maintenance to the 25th Division. Through purely physical efforts, the officers and men improved existing facilities and built new facilities for themselves and their customers, according to a unit spokesman. Included in this revamping were the erection of new buildings, rewarehousing and elevation of open storage for proper drainage at tech supply. Administratively, the 725th improved its existing supply and maintenance procedures to insure better customer service. Included in this administrative improvement was the return to the depot of more than a million dollars worth of low-demand items. While the supply aspects of the battalion were being improved, the maintenance backlog was going down continually. One factor that lowered the backlog was the dispersing of contact teams through the 25th Divisions area of operations. This resulted in the lowest possible down time for the equipment. By the end of the period, the division had the use of better than 99 per cent of its equipment, according to the division material office. DAU TIENG  Every new man in country wonders how he will react the first time he comes face to face with the enemy. A new 25th Division trooper recently found out. Private First Class Les Bechdel, from State College, Pa., joined Company A, 2nd Battalion, 14th Infantry Golden Dragons, about a month ago and hadnt seen any action his first few times in the field. "The thought of actual combat with another man always bugged me," Bechdel said. "I thought I could react properly, but you always hear stories of guys freezing up and all." Bechdel was walking with the point element of the Dragons on a recent sweep of some NVA bunker complexes. As the unit broke out of a woodline, the "newbie" spotted a VC soldier squatting next to a bomb crater. "At first, I kind of just froze and started to tell the pointman I had spotted a VC," Bechdel reflected. "Then it hit me that I had better start shooting before he did." He opened up on the enemy soldier with his M-16 rifle, and the rest of the element quickly followed suit. The results of the action: one VC killed, one Chi-Com hand grenade captured and one new man ready for action any time the need arises. CAM MY VILLAGE  MEDCAPs (Medical Civic Action Programs) have been going on in Vietnam for a long time, but recently, the 25th Divisions 2nd Brigade Psychological Operations (PSYOPS) Section came up with something new  the SUPERCAP. A SUPERCAP is an internationalized MEDCAP where not only medical aid but dental care, gifts, candy, soap and movies are provided to the Vietnamese people. The medical aid portion of the SUPERCAP was provided by the medics of the 4th Battalion (Mech), 23rd Infantry. With the aid of Vietnamese interpreters, the medics diagnosed and treated a wide variety of ailments. Meanwhile, in keeping with the spirit of working together, a contingent of Australians, led by Captain Alan Johnston, provided dental aid. Throughout the afternoon, Tomahawk GIs handed out large amounts of candy, washing detergent, South Vietnamese flags and dental care kits to the pressing crowd. Eager children swarmed the GIs several times in their scramble for the gifts. After those needing medical and dental attention were treated, a PSYOPS team took over. The team provided entertainment in the form of motion pictures which the villagers seemed to enjoy.